If your baby has a dry mouth and lips, as well as being very drowsy and hard to rouse, he may be suffering from dehydration. If he is under 18 months, check that the fontanelle (the soft patch at the very top of his head) is not sunken. If it is, this may indicate dehydration. Keep an eye on his nappies. If you notice that his urine is dark yellow or that his nappies are dry, he probably dehydrated. How should I treat dehydration? 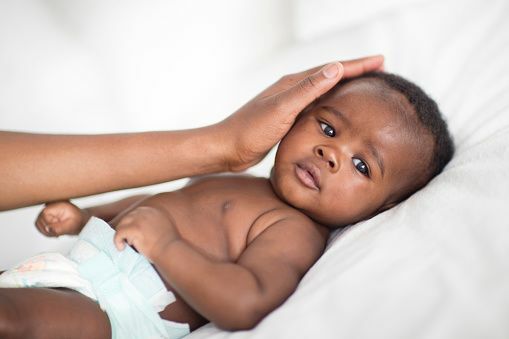 Reduce any fever your baby may have with infant paracetamol or dab his forehead with a tepid, damp sponge. If he is still bottle fed, replace his milk feeds with cooled, boiled water, either in his bottle or from a spoon or cup. Try giving him just water for six hours instead of milk. If you are breastfeeding, continue exclusively breastfeeding your baby as he should be getting enough fluid from the breast milk he drinks to rehydrate him. A doctor should be consulted if your baby continues to have diarrhea, vomiting or fever for more than six hours or doesn’t seem to get any better after you have given nothing except cooled, boiled water over this time. For an older child, encourage him to drink something (preferable water) every ten minutes for a few hours. Avoid milk or fruit juice. If he is vomiting, it may be difficult for him to keep the fluid down, but you can rest assured that his body will be absorbing some fluid and it’s certainly better than none at all. Try giving your child sips of water from a spoon so he is taking in small amounts all the time. The key here is to offer liquid little and often. If he can keep any food down, try something like scrambled egg and plain bread. The egg will help to ‘bind’ him if he has diarrhea. Try an oral electrolyte solution, available from any chemist, to replace lost salts and glucose in your child’s body. Remember to follow the instructions given on the packet, making sure the dosage is suitable for the age of your child the solution should be given to him the moment it is made up. Please note too that it is best to check with your doctor first before you begin any treatment for dehydration.